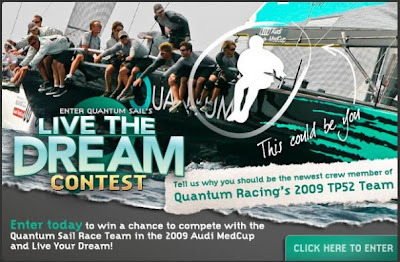 Starting tomorrow, May 29, Quantum Sails will begin accepting entries to win an all-expenses-paid trip to be part of the crew on board TP52 Quantum Racing for the Audi MedCup event in Portimao, Portugal. The regatta will take place on August 18-23, 2009. Essays up to 300 words accompanied by one photo, or video essays of less than two minutes will be accepted. The entry form will go live on the QuantumSails.com website on Friday, allowing participants from around the world to submit their best stories. A judging panel will narrow down the finalists, and then, for one week in mid-July, the public will be invited to pick their favorite to determine the winner. The winner will receive a round-trip airline ticket from their nearest major airport to Portugal on August 14, 2009, ground transport, ten nights at the four-star Tivoli Marina Hotel in Portimao, three days of practice and six days of racing (weather permitting) on the TP52 Quantum Racing along side top professionals in the world of yachting, including 2008 Yachtsman of the Year, Terry Hutchinson. The winner will be a full member of the racing crew and will be involved in all team activities. Quantum Racing crew gear will also be provided, along with full access to the Audi MedCup village, crew facilities, and special events.